Reading news reports and statements in and by the media, public at large, NGO, activists and the world media – it looks like the accused, entire villages, the entire Hindu community of Jammu the J&K Bar Council, the BJP party members are ALL GUILTY AND IT IS A MATTER OF ONLY A FAIR AND QUICK TRIAL TO PROSECUTE THE GUILTY. The most recent is the Supreme Court’s comment which said, “IF IT FINDS THE SLIGHTEST POSSIBILITY OF LACK OF FAIR TRIAL, IT WILL TRANSFER THE CASE OUT OF KATHUA”. The villagers and the entire area is under the J&K government which is totally against Jammu and this incident is causing them to create more harassment for the community. 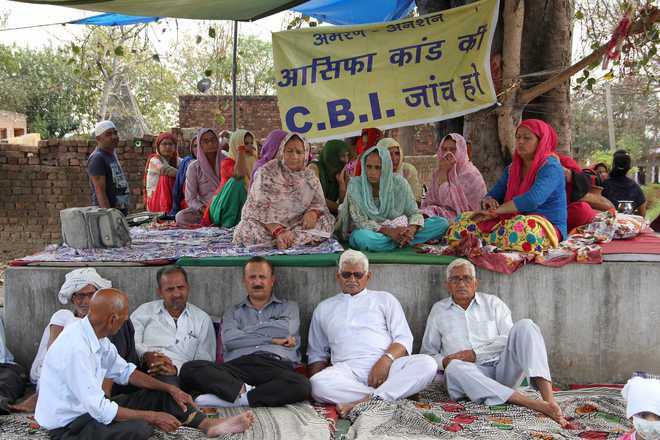 The community is asking for CBI to handle the investigation – so what is wrong? Why is the state government and even Supreme Court not allowing it. The investigation has to precede the trial and the ACCUSED ARE SAYING IT HAS BEEN AN UNFAIR PROCESS with the local police and government having framed incorrect charges? There are reports of numerous inconsistencies in the charge sheet. COULD THE SUPREME COURT HAVE SAID THE SAME THING ABOUT THE FAIRNESS OF THE INVESTIGATION? Further, if the trial is not fair it can always be retried. What is the hurry to finish this is a short time like 90 days? What happened to other major calamities like Sikh riots, ethnic cleansing of pandits from Kashmir and on and on? Let us not forget the Jammu region is already treated badly and this just added to it.